The NFL is back – and with it comes the grueling ever-tormenting struggle of weekly start/sit decisions. Have you ever felt like your fantasy players hate you? That, when torn between two players, you always pick the wrong one? Or, every time you finally move an underperforming superstar to your bench, they have a monster game just to spite you? Well, good news! Hi, I’m Scott Barrett, and I’m here to help. Here are my Week 1 start/sit recommendations for shallow, medium, and deep fantasy leagues. Note: If you don’t see one of your players mentioned below, please refer to our rankings. Jeff Ratcliffe, Pat Thorman, and I all ranked top-20 in the FantasyPros Rankings Contest last year. If Bell is active for Week 1, you’re playing him – he’s Le’Veon Bell. If Bell is out for Week 1, I’ll have Conner ranked as a mid-range RB2. Conner has been our highest-graded running back this preseason. On 56 snaps, he totaled 19 carries and seven targets for 161 yards and a score. Since 2015, Bell’s primary back-up running back has averaged 22.4 fantasy points per game across the 11 games he’s missed. That would have ranked third-best at the position last year. Yes, Beckham has one of the toughest cornerback draws of the week, in shadow coverage against our No. 1-graded cornerback from a season ago (Jalen Ramsey). Still, he’s easily one of the best wide receivers in the game, and, statistically speaking, he’s the most cornerback-immune wide receiver of the past decade. The Seattle defense is a shell of its former self and Sanders, this preseason, looks nothing like the player we saw last year, battling through injuries for most of last year. QB Case Keenum targeted Sanders on a whopping 43.8 percent (14 of 32) of his aimed throws this preseason and Sanders may continue to push Thomas for WR1 volume well into the year. He’s run 63.9 percent of his routes from the slot this preseason and Seattle gave up the sixth-most fantasy points to slot wide receivers last year. Doyle played on Andrew Luck‘s first two dropbacks in Indianapolis’ final game of the preseason, and then sat out for the rest of that game. Up until that point, Doyle ran a route on 27 of Luck’s 28 dropbacks and saw six targets. The next-closest player saw four, and Eric Ebron ran just nine routes and saw just two targets. Doyle has our best tight end matchup of the week and Cincinnati ranked fifth-worst in schedule-adjusted fantasy points allowed to tight ends last year. There is some cause for concern regarding Luck’s atypically low (5.7 yards) average depth of target during the preseason, but that should only help Doyle, who has a 5.8-yard aDOT over the past two seasons (compared to T.Y. Hilton‘s 13.5). 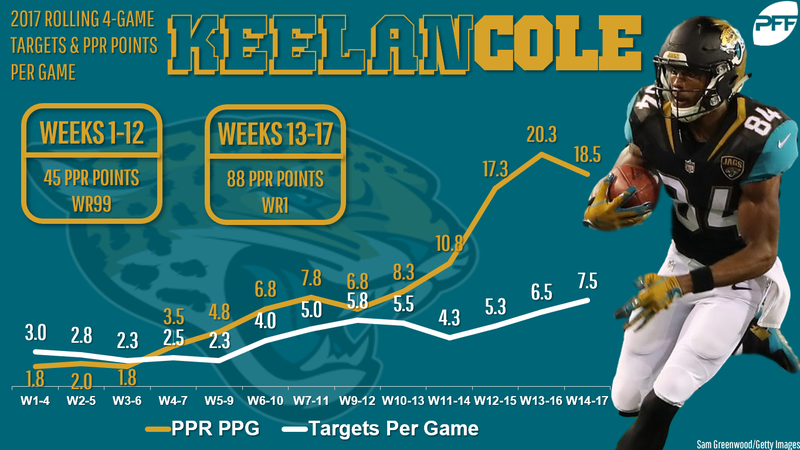 With Marqise Lee on IR, we should expect Cole to be Blake Bortles’ favorite target this season and, by extension, this week. In the two games Lee sat out last year, Cole commanded a whopping 25 percent of Bortles’ pass attempts. Cole should spend about one-third of his time against each of New York’s three starting cornerbacks this week. While Janoris Jenkins is a tough draw, Eli Apple and B.W. Webb are far more beatable. Per our WR vs. CB Matchup Chart, we’re projecting Casey Hayward to shadow Watkins in Week 1. After a lackluster preseason, Watkins is an easy fade up against one of the best shadow cornerbacks in the game and our No. 2-graded cornerback from a season ago. If you own Nelson, you likely drafted him as a low-end WR3 or high-end flex-play. This, however, is not the week to play him, up against Los Angeles’ revamped and stout secondary. Cornerbacks Marcus Peters and Aqib Talib both graded out top-15 of 120 qualifying cornerbacks last season. While Morris is likely the favorite to lead the 49ers in rushing this year, Matt Breida worked with the first-team offense in practice this week. Morris has also admitted he doesn’t yet know the full playbook. This is also a brutal matchup, as 6.5-point underdogs (negative game-script especially hurts running backs who are non-factors in the passing game) against a Minnesota defense that ranked best in fantasy points per game allowed to running backs last year. While I like Garoppolo’s season-long prospects, I’m especially wary this week. In 2017, starting quarterbacks averaged just 8.9 fantasy points per game against Minnesota in U.S. Bank Stadium. In shallow leagues, I’d be looking at the free agency player pool to see if there wasn’t a quarterback worthy of a sport-start. Hyde was dominant this preseason (6.4 yards per carry), while rookie Nick Chubb struggled greatly (3.1). I expect Hyde to dominate early-down work this week but I don’t see much upside there with PFF Greenline predicting Pittsburgh to win by 5.0 points. Hyde is a fringe RB3 in my PPR rankings but a slightly better play in standard leagues. Agholor averaged 7.5 targets per game over his final eight games of the season (including playoffs) and now Philadelphia will be without Alshon Jeffery in Week 1. In addition to improved volume, Agholor also has a soft matchup. Atlanta has ranked bottom-five in fantasy points allowed to opposing slot wide receivers in each of the past three seasons. Even in shallow leagues, teams looking for a spot-start from a quarterback (likely Carson Wentz or Jimmy Garoppolo owners) can do a lot worse than Taylor, who I have ranked as a fringe-QB1 this week. On paper, the matchup plays to Taylor’s strengths and Taylor’s supporting cast is now the best of his short career. PFF Greenline expects New England to win by 9.5 points, suggesting Houston will need to rely on Fuller’s deep-threat ability this week. New England also has a long history of selling out to stop a team’s primary offensive weapon, which suggests a much tougher draw for DeAndre Hopkins, opening up targets for Fuller. Indeed, per our WR vs. CB Matchup Chart, we’re expecting Stephon Gilmore to shadow Hopkins and Eric Rowe to shadow Fuller. Of 120 qualifying cornerbacks last year, Gilmore graded 11th-best while Rowe ranked 109th. With Green Bay favored by 7.5 points, I don’t see much upside for scatback Ty Montgomery. However, all of that positive gamescript (and the absence of Aaron Jones) sets up nicely for Williams. Mike McCarthy said last week he thinks Williams is “poised for a big year.” He’ll need to perform well enough to keep Jones on the sideline for that to be true, but, at least, I see a big game for him this week helping his cause. Stills ranked 23rd among wide receivers in targets last year and 27th in fantasy points, despite Jarvis Landry and DeVante Parker combining to total 251 targets. Now, Landry is in Cleveland and Parker is out for Week 1. Based mostly on volume, Stills is a terrific play this week despite what’s likely a below-average matchup. Reed was one of my favorite targets all offseason – I loved the value he offered from a risk/reward standpoint. However, I knew he’d be risky in the early weeks, coming back from toe surgery. However, per Washington beat writer J.P. Finlay, head coach Jay Gruden has said Reed is “in great shape” and expects him to play “quite a bit.” That’s enough for me to push him up into the low-end TE1 range. I understand you drafted Coleman as a mid-range RB3, but his season-long value has more to do with his potential if Devonta Freeman suffered an injury than week-to-week playability. In games Freeman played more than two snaps last year, Coleman averaged just 9.7 fantasy points per game. In Week 1, before byes and injuries, you should have better options on your roster. Although Crowell had the higher ADP in August and September drafts, I’m far more bullish on Bilal Powell, who was used as something of a bell cow by the Jets this preseason. At the very least, Powell is the better option in the passing game, and, as 6.5-point underdogs, the gamescript works more towards his favor. Powell would be a start for me in medium-sized leagues, but I’ll need to see a big game from Crowell before I slide him into my starting lineup. I’m bullish on Brown in season-long leagues but not this week as 7.5-point favorites against the Bills. Brown is a terrific deep threat with 4.34-speed, but in a game that should be a blowout, I don’t see Baltimore needing to look deep very often – and especially not against a Buffalo defense that surrendered the fewest fantasy points (to wide receivers) on deep passes last year. While Barber was a late-round favorite of mine, he’s not someone I want to rely on in Week 1. I suspect he’ll dominate early-down work, given he’s listed as the starter and rookie Ronald Jones was dreadful this preseason, but Jacquizz Rodgers should be locked into the third-down and pass-catching role. That means Barber is far too risky in a game the Saints are favored by 9.5. The Colts have our worst-rated secondary this season and, on top of that, their first-quarter defense ranked last pressures per dropback this preseason. Indianapolis ranked fifth-worst in schedule-adjusted fantasy points per game allowed to quarterbacks last year. Now, with Andrew Luck healthy and likely keeping the score close, Dalton (and his revamped offensive line) should be in for a big game. Projected gamescript isn’t in White’s favor, but the team’s lack of viable receiving options is. White was targeted on eight of Tom Brady‘s 41 attempts this preseason. While Rex Burkhead is certainly worth a start in shallow leagues (if Sony Michel is out), White is still in play as a fringe RB3 in PPR leagues this week. In opposition to our WR vs. CB Matchup Chart, I actually think Amendola has a tough cornerback matchup this week against Logan Ryan. Still, given the amount of targets available with DeVante Parker out, I don’t think it matters. For all of the reasons outlined here, Amendola is well worth a roster spot in your deeper leagues this year – and a starting spot this week. In PPR leagues this week, I (boldly) have Amendola ranked 34th among wide receivers. Yes, Peterson is 33 years old. Yes, he was dreadful last year (our worst-graded running back). Yes, he probably won’t see a single target this week. Still, he’ll draw the start in Week 1. With the Vegas spread within 1.0, game-script is unlikely to get too out of hand to push Peterson out of the game. He’s by no means a great play, but if you need a low-end RB3 in PPR or a high-end RB3 in standard leagues, volume should be good enough to warrant the start. Yes, even in deeper leagues, I’m not yet ready to trust Johnson in my starting lineup. With LeGarrette Blount and Theo Riddick listed as the co-starters, I don’t see much upside for Johnson. If Blount gets all of the goal-line work and Riddick gets all of the targets, where does that leave Johnson? He’s still worthy of a bench spot, of course, but I don’t see myself starting him anytime soon. This one is tricky. Gillislee is one of only two running backs on New Orleans’ roster. The team is favored by 9.5 points. If Gillislee does assume the Mark Ingram role in the offense, he’ll likely be productive in that role. Unfortunately, given he just joined the team on Sunday and likely has a limited knowledge of the playbook, I have trouble trusting the team doesn’t just hand Alvin Kamara a Le’Veon Bell-esque workload for Week 1. I have him ranked as a low-end RB4 this week. For much of the same reasons we’re starting Doyle in shallow leagues, we’re benching Ebron ever in deeper leagues. Based on preseason usage, I’ll need to see a big game from Ebron before I can trust him in my starting lineup. This one is easy. If I’m benching Peyton Barber in medium-sized leagues, of course I’m benching his backup who totaled just 22 yards on 28 carries (as well as two drops on three targets) this preseason. Based on ADP, you likely overspent on Jones. At this point, I’m not even sure he’s worth rostering.